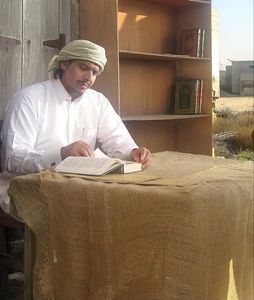 On November 29, 2012, the Criminal Court in Doha convicted Mohammed al-Ajami for “inciting the overthrow of the ruling regime” and “criticizing the Emir” for two of his poems, and sentenced him to life in prison in a two-line judgment. The poet was not present for the decision. His sentence was later reduced to 15 years on appeal on February 25, 2013. That sentence was confirmed by Qatar’s Supreme Court on October 21, 2013, despite arguments that the charges and trial were deeply flawed. Al-Ajami was held in solitary confinement in Doha’s Central Prison with extremely limited visitation rights in violation of UN principles. On 23 October 2013, representatives from PEN American Center were prevented from visiting him despite having been told their visit had been approved. For more details read ‘Qatar: A poet sits in a desert cell for reciting his work at home’ by Joanne Leedom Ackerman. Born on December 24, 1975, Mohammed al-Ajami, a Qatari citizen, is a poet. He is married with two daughters and two sons, the youngest of whom was born while he was in prison. Mohammed al-Ajami was arrested in Doha on November 16, 2011, after being summoned by state security. He was reportedly charged two days later with “inciting the overthrow of the ruling regime” and “criticizing the Emir” for two of his poems. The first was never written down but rather spoken in a private poetry slam among friends at Cairo University in August 2010 in response to a fellow poet. That poem was surreptitiously recorded and posted online. The case file against al-Ajami includes responses from three poets employed by the Culture Ministry, asserting that the poem is a veiled call to challenge the authority and competence of the state. The second poem, “Tunisian Jasmine,” written in 2011, expresses support for the uprising there, and was also recorded and posted online. During the trial, which was held in secret, al-Ajami was repeatedly kept from court and his defense lawyer, Dr. Najeeb al-Nauimi, was barred from giving oral arguments. Two different lawyers were appointed to al-Ajami despite the fact that Dr. Najeeb had already been retained. During his pre-trial detention, al-Ajami was held incommunicado for months before being permitted family visits. In March 2016, al-Ajami received a royal pardon and was released from prison after more than four years. Al-Ajami is an honorary member of PEN American Center and German PEN. View an interactive infographic about Mohammed al-Ajami’s case.